This entry was posted in Dining, History and tagged 4th Earl of Sandwich, John Montagu, origin of the sandwich. Bookmark the permalink. I’m partial to the breakfast sandwich – a veggie sausage patty and smoked cheddar cheese between an English muffin. For dinner, either a BLATCh (bacon, lettuce, avocado, tomato, and cheese) or a muffaleta. Or a Caprese with tomato, buffalo mozz, fresh basil and a balsamic drizzle. This is making me hungry! As far as I know, there isn’t a sandwich named the Reeder. With your instincts for food, maybe you need to invent one — some combination of the ingredients listed above would be a winner, I’m sure. BLT is tops in my book, but I have never been known to turn down a sandwich I didn’t have to prepare myself. That’s a couple of votes for versions of bacon, lettuce and tomato. That’s high on my list, too. Most commercial sandwich makers have lost sight of the sandwich’s purpose: a one-handed meal. The hamburgers built now are formidible, five-inch constructs that have little to do with the human mouth. When they’re attacked for a couple of bites, both the burger and the attacker’s face look like road kill. You’re right, Steve. 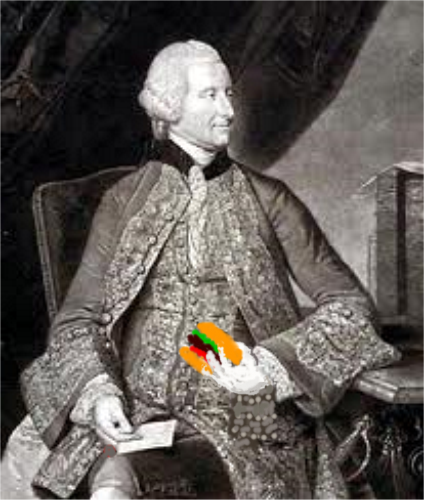 If the original sandwich had been that size, the 4th Earl of Sandwich would not only had to have put down his cards, he would have needed a change of clothes.